Can I use the DM510 to see/control my grain drying on my smartphone? The key question these days! Yes, simply connect the DM510 to an internet router, or WAP (Wireless Access Point), or cellular hot spot and you can view your drying on line in any web browser, no app required. You can even make changes to drying set-points. The data you see is live and you also have access to several days worth of historical information and real time graphing. (see our YouTube video ). Will it work on my grain dryer? The DM510 can be used on almost all continuous flow grain dryers. So whether you have a screen dryer or a rack dryer or a farm dryer or a tower dryer, the DM510 can be a valuable upgrade. The DM510 is not designed to work on in bin dryers. How can it work on all brands and sizes of grain dryers? The beauty of the Dryer Master technology is that each system is easily configured to your specific dryer. Once the configuration is complete the DM510 learns about your drying process, building a model for your dryer and drying conditions. Can I use it to dry more than corn? Certainly. The DM510 comes preconfigured to be used on up to 8 different products (corn, wheat, soybeans, etc.). Does it control the drying temperature? No. The DM510 only controls the discharge rate (metering roll speed). Our research has shown that trying to control two parameters (for example, speed and temperature) on a process with so many variables, leads to more problems than it solves. How does Dryer Master automatic control work? The DM510 uses its real time moisture sensors to build a profile of all the grain in the dryer. It then uses its model of how the dryer is drying to figure out what is the best rate to be running the dryer at. 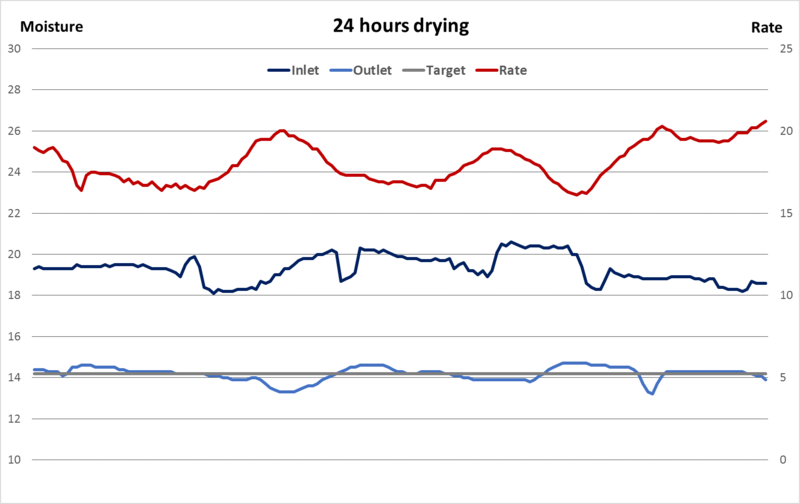 Then as incoming moistures change and drying conditions change throughout the day it keeps updating its model and its profile of what is in the dryer, and keeps on figuring out the best unload rate to use. If something goes wrong with the DM510 can I still run my dryer? Definitely. The DM510 is designed to connect to your dryer only through the unload rate. By switching to local mode your grain dryer can be run exactly as it was run before the DM510 was added. Can I put the outlet sensor in the bottom of an auger? No. Our 30 years of experience with the Dryer Master moisture sensors has taught us what will and what will not work. In general Dryer Master sensors need to be installed vertically in compacted grain flowing at less than 1 inch per second. A Dryer Master project engineer will be happy to go over the situation at your facility and to help you select the best installation option. 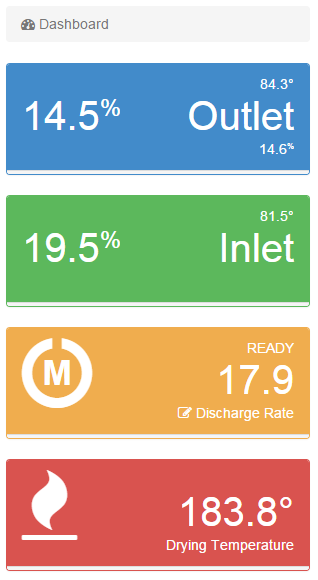 How do I calibrate the outlet moisture sensor? We have tried to make calibration as simple as possible. Just go to the outlet sensor, push the calibration push button. A green light will flash for 30 seconds. During the 30 seconds take a gradual manual sample. Then test your sample in your bench top (an average of three results is best). Then go to the DM510 panel and enter your reading. The DM510 will have already calculated its moisture reading for the 30 seconds that the light was flashing. The DM510 will then adjust its readings to reflect the new moisture sample results. Will all my grain come out at the moisture setpoint? Sorry to disappoint you, but no. Physics just does not allow it. Drying in a continuous flow dryer means that if for example you put wet grain followed by drier grain followed by wetter grain into the dryer there is no way all the grain can come out at the same moisture. Some will be more dried and some less dried. The DM510 will try to reduce the variation and center the moisture around the set point so that once the grain goes to storage it can temper to the average moisture. What do you mean by “moisture setpoint”? The “moisture set-point” is the average moisture you would like to see exiting the dryer. It is important to realize that the value is an “average” and that to get an average there will be as much product above the average as below it. How is the DM510 different than other moisture controllers on the market? There are 3 key differences. The first difference is that the DM510 builds a model of how your particular dryer i s drying. It does not rely on charts or other “hypothetical” information. It does not care if you are in Michigan or Kansas, it doesn’t care if you have a farm dryer or a tower dryer, it doesn’t care if you have a screen dryer or a dryer without screens, it doesn’t care if you are taking out 10 points of moisture or two points, and it doesn’t care if it is 80 degrees (F) or 0 degrees (F). The model looks at your drying situation and makes adjustments to your situation as conditions change. The second difference is that the DM510 uses its model and its inlet moisture sensor to make changes to your drying as new product enters the dryer (exactly when you want it to adjust). It also allows the DM510 to maintain a complete picture of all the grain in the dryer. If you only use an outlet moisture sensor, any changes you make will be after the fact (too late). The third difference is that Dryer Master moisture sensors measure moisture, using similar technology to what your bench-top tester uses. They are not using grain temperatures in the columns to “infer” moisture. Where I can learn more about the DM510? You can visit our web site at www.dryermaster.com. In addition, all of our product guides (user guide, installation guide and commissioning guide) are available at support. There are also two training videos available at the bottom of the page. Where can I buy a DM510? You can buy from us directly, or from one of our authorized dealers. To find the dealer in your area go to Dealers or you can call us at 1-800-265-2757 or (519) 725-4700. At Dryer Master we have a Customer Support Center with staff available to answer your questions. In North America you can call toll free 1-888-318-0009 and from overseas you can call the Support Center at 1-519-725-4700.